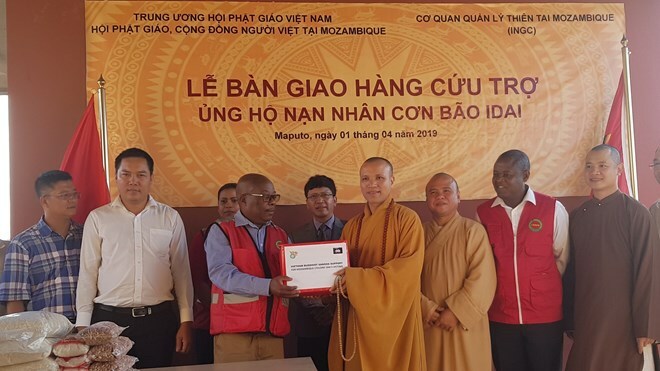 Hanoi (VNA) – The Vietnam Buddhist Sangha (VBS) Central Committee, the Vietnam Buddhist Association (VBA) and the Vietnamese community in Mozambique have sent 20 tonnes of food to victims of Tropical Storm Idai that ravaged the African country’s central region in mid-March. Addressing a handover ceremony in Mozambique’s Maputo capital city on April 1, Superior Monk Thich Dong Hue, member of the Executive Council of the VBS Central Committee and head of the VBA, expressed his hope that local authorities and people will soon overcome the consequences of the storm. Casimiro Abreu, Acting Director of Mozambique’s National Institute of Natural Disaster Management, lauded the good deeds of Vietnamese Buddhists and people in general to aid the storm victims. He thanked the Vietnamese Government and people for their valuable spiritual and material support. Earlier, Movitel, a joint venture between Vietnam’s military-run telecom group Viettel and Mozambique’s investment company SPI, granted 50 tonnes of food to Sofala province, which was hardest hit by the storm. The company has also joined hands in restoring the information system and provided relief aid in many Mozambican localities. Tropical Storm Idai was the worst natural disaster in the region in the past 30 years, killing about 790 people and affecting the lives of nearly 3 million others. In Mozambique, it left at least 518 people dead, 1,522 injured and 135,000 homeless, and destroyed 3,318 schools. Many areas around Beira city and the central region of Mozambique are facing flooding, power cuts, food and water shortage and disease risks.